19mm x 77mm CNC drill bit source? 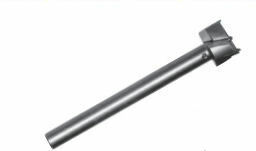 I need a 19mm x 77mm brad point RH drill bit, 10mm shaft with flat. Does ANYONE have a clue where I could find another? Vortex is a no go unless I have them custom made. We have the 19mm in a 70mm OAL, 77 would be a custom for us also. I was all over your site yesterday and you had the best selection of anyone, I just wish I didn't need the additional length of the 77mm. What if we could take a 3 wing drill 3/4" Dia x (19mm .748) x cut the shank to get 77mm OAL x turn shank to 10mm and put a flat on the shank? Can you email/message me a quote for a quantity of 6?